Have Window Defoggers™ Repair Them! fraction of the cost of window replacement. Let us remove the fog in your windows. Our Service Area includes the Greater Seattle area of Washington. Do you have blue haze, fog, dampness, moisture or condensation in your double pane windows? Do your wood window frames need repair? 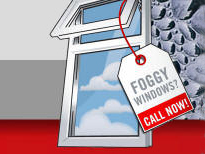 Window Defoggers can fix foggy windows at a fraction of the cost of window replacement. We can remove the fog in windows quickly and easily without replacing your window frames. And we can repair your wood framed windows at a fraction of the cost of replacing them. We offer Glass Replacement to restore your view in all windows. We just replace the glass leaving your original window frames intact. This is far less expensive than full window replacement. We repair wood windows, vinyl windows and aluminum framed windows. We even replace glass in wood doors. We offer a 10-Year Warranty on all glass replacement glass against future seal failure. Contact us today to have Window Defoggers™ repair your fogged double pane windows. Let us remove the fog in your windows!